Peak Inn is a beautiful thatched manor located near the heart of Cape Town. The inn offers comfortable bed and breakfast accommodation ideal for couples or business travellers. The inn has four rooms on offer, each with its own style. All bedding is included and the rooms are furnished with TVs, refreshment trays, hairdryers, bathrobes and personal toiletries. Secure off-street parking with an automated gate, wireless Internet, laundry facilities, fax and e-mail facilities are available. Evening meals are also provided on request. Situated in the leafy suburb of Pinelands, guests can relax in the guest lounge while watching TV, or sit on the patio which leads to sparkling swimming pool where guests can cool off on warm summer days. 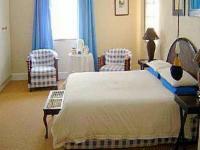 Jade room Sleeps 2 Includes: B & B Both these rooms are downstairs with twin beds& en-suite bathrooms. Crystal Room Sleeps 2 Includes: B & B This room is upstairs & has an en-suite bathroom, twin beds & private patio. 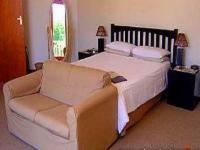 Sapphire room Sleeps 4 Includes: B & B Twin bedded en-suite. Can sleep 4. 2 adults and 2 children. Peak Inn Manor is 8.5km from the centre of Cape Town , the nearest airport 11.9km (Cape Town International Airport).